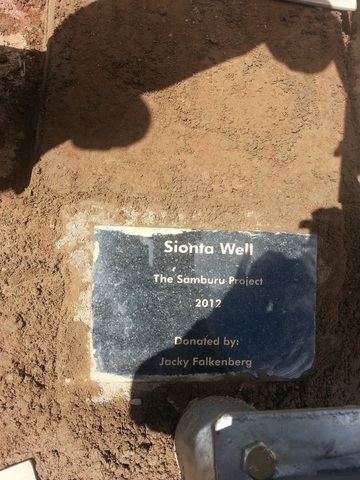 Funded by Jacky Falkenberg's Walk for Water, The Samburu Project will drill and install a shallow well equipped with a handpump in the Sionta Community. This community has no water within their reach. They currently travel 8 km to get water. 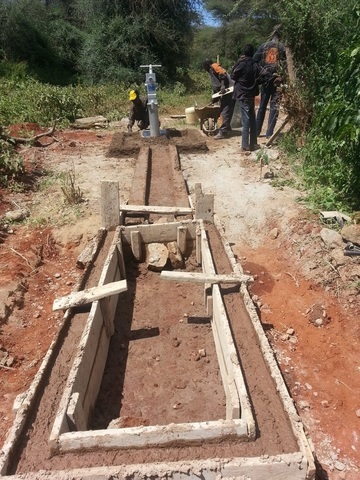 A well in Sionta will drastically reduce the time women spend in search of water. It will reduce the incidence of waterborne diseases and give women enough time for other productive business. This community is particularly interested in starting a horticultural project as soon as the well is drilled and equipped. Lucas found the community to be incredibly cooperative, organized with an existing merry go round scheme for loans and ambitious. Six sites were surveyed before Kariuki found a viable well site. Lucas spent the day in Sionta overseeing well construction. The community will soon be drinking clean water! Water Struck at 31 Meters! On the first day of well drilling, water was struck at 31 meters! It's a mystery to us how just a slight change in location can prove to find successful well sites! A long conversation with Kariuki would likely leave you feeling confused but definitely more informed as to how hydrogeology works. Truly amazing. After surveying six locations in Sionta, Kariuki found a viable site. After surveying 5 sites, Kariuki was unable to find a viable location for a well in Koiting. Tomorrow, they will move across the road to Sionta in hopes of better luck. Approximately 25% of the students come from the Sionta Community, the rest are boarders from other communities. This raises the population of people getting water and other resources by 255 during school.